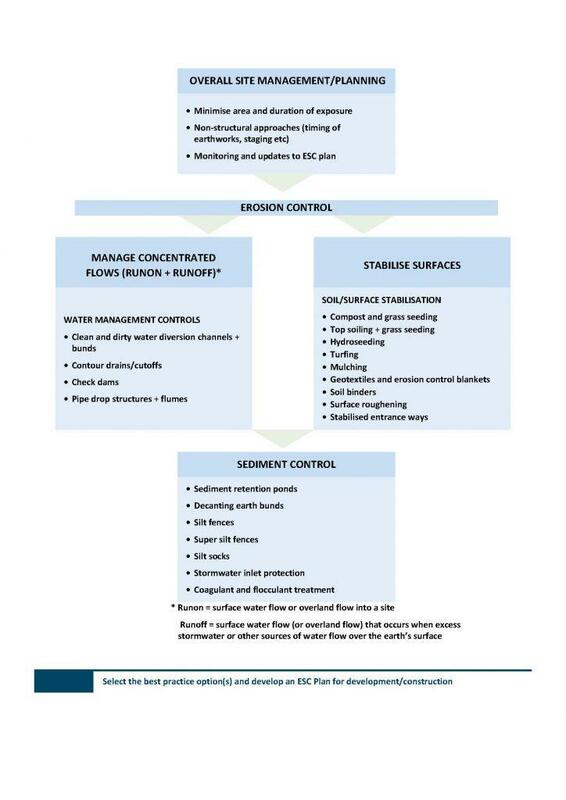 Guide to choosing erosion and sediment control best practice tools. After considering the various factors and priorities identified as part of planning, one of your first steps in setting up your project will be to create your initial Erosion and Sediment Control (ESC) Plan. This is an essential part of planning your project. Allow enough time to gather the necessary information and to consult many other parties. An initial ESC Plan is needed as part of your application for Resource Consent. You will later develop this into your full ESC Plan. See the planning section for more information. There is more detail about the consent application process in general on the Environment Canterbury website. The steps below highlight the ESC aspect of the consent application process. To prepare your initial ESC Plan application and your Resource Consent application, preferably engage a consultant suitably qualified and experienced in your proposed activity to be able to assess the effects. For example, if there could be ecological effects, get advice from someone qualified in this area. If you do not engage a consultant, you can prepare your application using information from Environment Canterbury’s website. Explain your mitigations, and why these are an acceptable level of effect. The plan needs to be detailed enough that consent planners and compliance monitoring staff will see that you genuinely understand the risks of wind and water erosion for your particular project and site, and have outlined tools and mitigations that should work. Provide conceptual construction – eg, where will the discharge go? The consent planner doesn’t need to see finalised and detailed design plans, but does need to be able to assess your proposed activity against Regional Rules. The planner will expect your approach to be generally in line with this toolbox, or to give clear explanations if other options are suggested. Your plan should have enough details that you can show the planner the measures and tools that you anticipate will be used to achieve best practice. Details may change, but you should be able to show the general layout, erosion control measures proposed for exposed surfaces, the potential location of retention tools. Understand the range of risk factors that affect your project across its stages – for example topography, rainfall, wind, duration of works for your site. This will help you build the detail of your plan. The plan should estimate costs for the ESC work. Allow enough budget for the right work to be done for the circumstances, including contingency funds for unforeseen events. Have a pre-application meeting with a consent planner before lodging your application. Contact Customer Services to request a Pre-App meeting. The first hour of this meeting is free. Lodge your application via Customer Services, with correct payment. You’ll be contacted to confirm whether the application has been accepted or rejected. This acknowledgement process is known as the ‘Section 88 check’ (of the RMA). Environment Canterbury will determine whether you have provided enough information for us to be able to decide whether the application will be notified or non-notified. Even if your application has been accepted under Section 88, we can still request more information. If we ask for more information, we’ll send you a letter detailing what is needed. Giving us the information needed. Refusing to provide the information. However, please note that the RMA allows us to publicly notify if information requests are refused. The application can also be declined at this point if there isn’t enough information to grant it. We will decide whether the effects of project are significant enough for the public to be notified, or if notification can be limited to affected parties, if the effects on them are minor, eg “What effect will your proposal have on a stream care group’s activities?” Notified applications go on to be subject to submission and hearing process. For consents that do not need to be notified, and if all the necessary information is provided, the officer writes a report summarising the effects and assessing the activity against Regional Rules, the National Environmental Standards, if applicable, and policy statements. The report includes recommended conditions. We send you the draft consent conditions, to check them for accuracy. Environment Canterbury then decides whether to grant the consent, and send you the decision. notify us of minor errors (typos), so we can correct them. Once consent is granted, you can start your project. You may be required to notify Environment Canterbury before you start. Prior to starting it is best practice to invite an Environment Canterbury Monitoring and Compliance Officer to a pre-commencement meeting, to go over how the project will run, ESC measures and achieving compliance. After implementing activities in the consent, if you find that things are not working, you can apply to change or delete consent conditions, including those relating to erosion and sediment control. This is the same process as above, except only effects of the proposed change will be assessed, not the whole activity again.